As a launch title for the extremely popular 16-bit console, I am positive that many of you have played or heard about Super Mario World. Not only was it the best-selling game on the Super Nintendo, but it also helped lead the charge against its competitor console, the Sega Genesis. In the long run however it also helped itself, selling over 20 million copies worldwide. So without further ado, let's look at this Nintendo masterpiece. 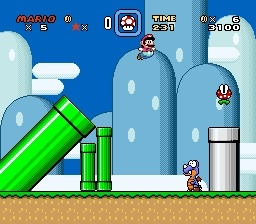 Being a platformer, gameplay in Super Mario World consists of making your way through levels that scroll horizontally as you progress. There are also a wide variety of enemies, all with their own unique abilities and traits. Take the Koopa Troopa as a fine example. Usually you can just jump on their heads, but sometimes they have wings and can hop around making them harder to jump on. Sometimes it's actually a requirement to do so, like to make a long jump across a large gap. It makes for some fun gameplay, and never gets old. This mechanic is executed perfectly into the game, so you are actually excited to see what new enemies you are up against. As far as graphics go, Super Mario World is full of 16-bit glory. Colorful sprites make it look amazing and with that, the game has aged extremely well and I still enjoy playing it today. The sprites and backgrounds also look surprisingly detailed for the Super Nintendo, adding even more to love about it. The bright, joyful colors are mixed in well with the actual gameplay to make it a very good looking and very nostalgic picture to behold. Music and sound is also where the game excels. While there are not a lot of actual sounds, it sure feels like there are. Everything has a nice tune to it, and the music sounds just like the pace of the level you are playing. Underwater? Check. Forest? Check. The music and sound definitely adds a lot more to the game. Heck, just listen to the Athletic theme. It's sounds nice and crisp, and is just... awesome. Furthermore, the game has tons of content and replay-ability. Going back to it even today, I am still finding secrets that I never found before. You could play it over and over and still not get bored, as the games also has a very fair learning and difficulty curve. You keep finding new mechanics to play around with, like the switch houses. Switch houses are secret areas in the game that you can get to and unlock even more secret areas. There is also a ton of variety between levels, and I mean a ton. They never feel like you have played them already, thanks to the awesome level design. You might be fighting fish underwater, then avoiding boos in a ghost house. It is extremely fun to see all this variety, as no other platformer had done it before. In fact, I would go as far and say that this inspired many games that game after it with its unique charm. With this game alone, Nintendo showed us the true power of the Super Nintendo and opened up a gateway for many other games after it. Super Mario World is widely regarded as the best platformer of all-time, and for many good reasons. Need proof? Play it yourself! The game was ported to the Wii Virtual Console as well as the GBA. You could pick up a GBA cartridge from almost any pawn/trade shop, but unfortunately the Wii online service has been discontinued, meaning that you can not buy virtual console game anymore. With that, I close off this retrospective. Super Mario World is my favorite game of all-time, ever since I got a SNES for Christmas. Thank you for reading.